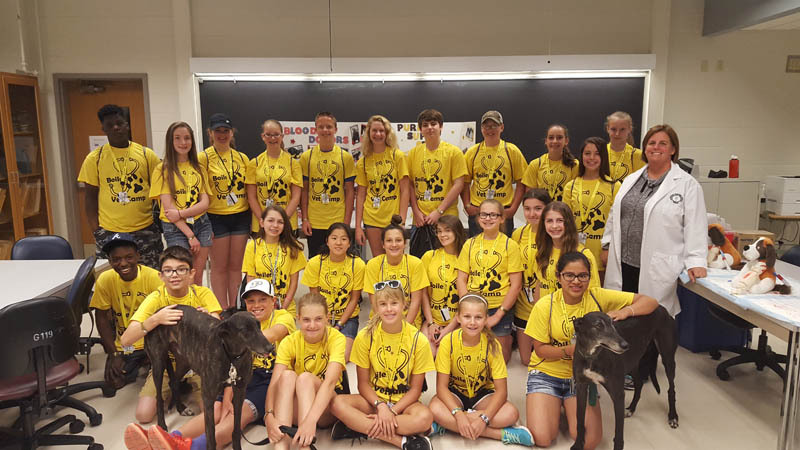 A time to meet your Boiler Vet Camp fellow campers, counselors and people from the Veterinary School. We will have plenty of food to eat and time to meet everyone. After eating, your counselors will lead you in interesting and exciting outdoor activities. An action packed session where you get to touch, smell, see what cows eat and learn why they eat it. You will even get to reach into a "real" cow's stomach. "Dissecting to the Heart of It!" Have you ever wanted to work with a real heart. This session gives you the opportunity to learn the different areas of the heart and their functions as you dissect the heart. You will have great fun learning just how similar a cow's, dog's or horse's heart is to your very own heart. With the fun and excitement of this session, your heart is sure to be beating fast! 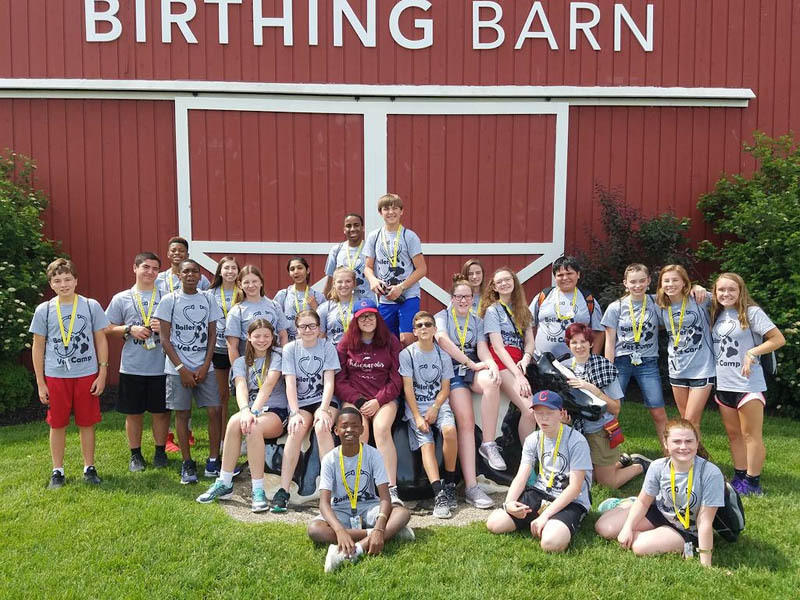 "Fair Oaks Dairy & Pig Adventure"
During this visit to one of Indiana's largest operating dairy farms (a mega dairy), you will get to learn many facts about cows and their health as well as get to see an operating dairy in person. There will be many activities to show you how milk gets from the farm to your refrigerator. With this many cows in one farm, there is sure to be many fun opportunities to learn and explore. You will get to see a large scale swine operation up close. The Fair Oaks Pig Adventure has many fun and exciting ways to see how piglets to adult pigs live. You will also learn how vetereinarians help to ensure that pigs remain healthy. It is not your typical patient, but veterinary healthcare professionals also treat fish too. During this session, you will learn how to evaluate the water which fish live and why it is important to keep not only a fish tank clean, but how this also applies to large ponds and lakes which hold thousands of fish. You will see how a fish is anesthetized for surgeries as well as you will get to learn about the body and structure of fish by dissecting various types of fish. Sometimes in order to learn why an animal dies, we have to conduct a necropsy (an autopsy). You will watch a veterinary pathologist perform a necropsy and learn the various parts of the body and what is normal and abnormal. During this session, you will get to watch a horse run on our equine treadmill. As you watch this horse reach 35 mph, you will feel the power of these great animals as they are running. In addition, you will get to see how veterinary healthcare professionals use small cameras to look into a horses airway to understand how it is breathing. As future veterinary healthcare professionals, you will get to see and experience this outstanding zoo from all angles. 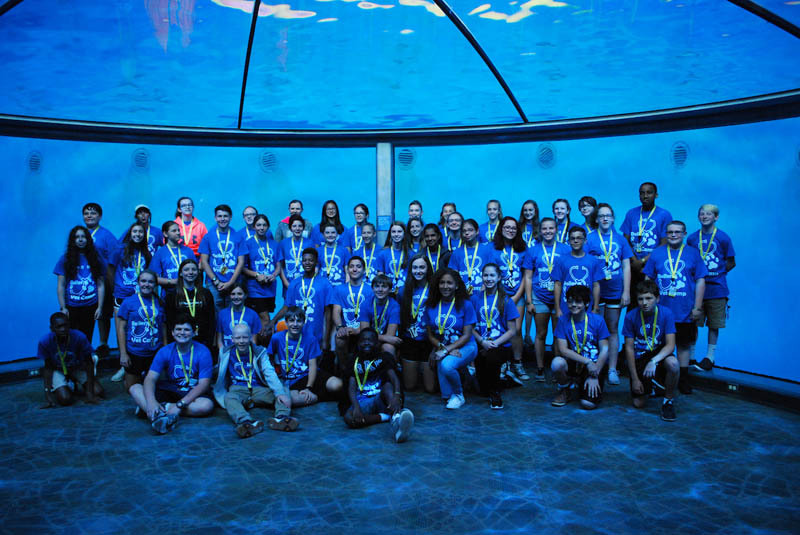 Our appreciation for zoo animals is important and as we learn about those veterinary healthcare professionals who take care of them, you will also learn and see why zoos are so important. Diagnosis of a disease or other problem is only the beginning. Where did the disease come from? Where has it spread? What was the source of contamination? The Amazing Trace will introduce some of the situations and mysteries faced everyday in regulatory veterinary medicine and how this specialty protects our food supply, as well as human and animal health. "Welcome to the Blood Bank"
Animals need blood at times too, so let's learn how we collect blood from donor dogs and then give it to dogs who are in need of a blood transfusion. During this session you will look at blood cells through a microscope, determine blood types and even get to practice giving an intravenous injection into a model. "From Our Farm to Yours"
During this learning session, you will have the opportunity to practice many hands-on skills and techniques used daily by food animal veterinarians and veterinary technicians. If you have never had the opportunity to give a cow a one inch pill, then this is your chance. You will have a great deal of fun learning and doing in this session. During the entire camp, you will learn and experience many new things. A fun way to pull it all together is working alongside of your fellow campers to "work through" a real medical case. Whether it be a dog with a fractured leg or a cow with a sick stomach, you will investigate the case, receive the diagnostic test information and determine the appropriate treatment. 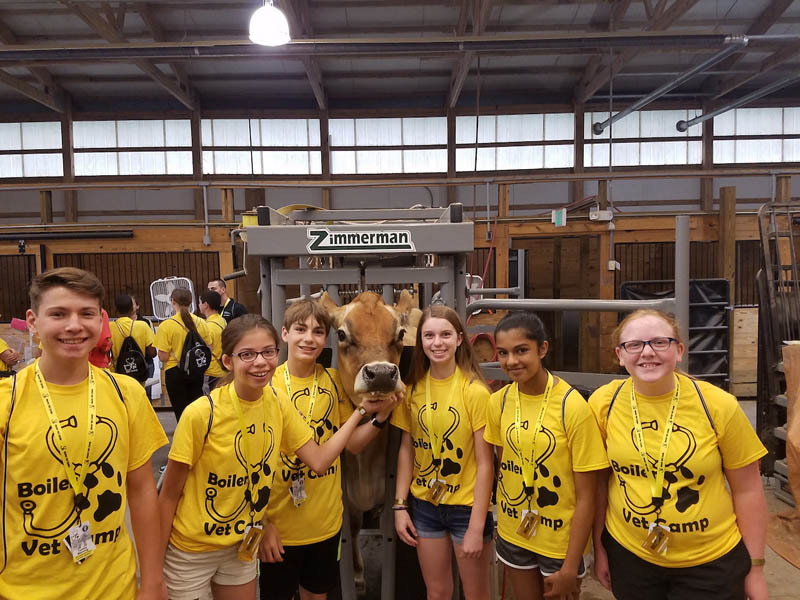 Working with you will be faculty from the School of Veterinary Medicine who will help you make the right decisions about how to best treat your patient. On Saturday morning, you and your group members will present your case to the assembled campers, parents and faculty.